The Age of Taurus spans approximately the period between 4400 and 2200 BC. It is the age defined by the Sun being in the constellation of Taurus on the spring equinox. Additional influences during this age are of Leo in the summer solstice, Scorpio in the autumnal equinox, and Aquarius in the winter solstice. 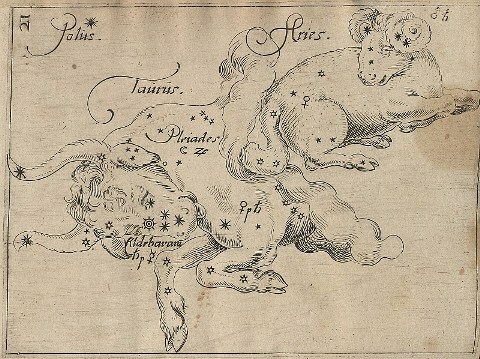 The more pure Taurus influence, outside the influence of the cusps of the earlier Gemini and the later Aries, was experienced between about 3900 and 2700 BC. This narrower period saw the unification of Upper and Lower Egypt (a trace of the duality of the Age of Gemini) and the Early Dynastic period (by 3600 BC); the fortification of the Sumerian civilization with its legendary figure of Gilgamesh; the establishment of the Minoan civilization in Crete; and the flourishing of the Harappan Civilization in the Indus Valley. The Element associated with Taurus is Earth, and as such, Taurus has a solid, practical, down-to-Earth, and sensual tone. It has an instinctive awareness, so it knows its place in the natural flow of things and it prefers the natural gut feeling over intellectual interpretation. It is hard-working, structured, steady and persistent, and at the same time it appreciates beauty. Its negative sides are excessive materialism, stubbornness, being possessive, nearsighted, and harsh. This age is notable for its amazingly vast architectural projects, such as the Pyramids during the Old and Middle Kingdoms of Egypt; the emergence of urban life in Mesopotamia peaking with the city of Uruk becoming the most urbanised city in the world, surpassing for the first time 50,000 inhabitants; and the walled cities of the Indus Valley, planned by the highly skilled Harappan architects. This period is also known for its great myths that survived to this day, such as the Creation Myth and the Myth of Osiris in the Egyptian Pyramid Texts and the Epic of Gilgamesh of Sumer, to mention very few. Technologically, the Age of Taurus saw the beginning of the Bronze Age at about 3300 BC and the first manufacturing of papyrus. Writing emerged in many different cultures during this age. Examples are the cuneiform writing of the Sumerians, the Egyptian hieroglyphs, and the Cretan/Minoan hieroglyphs. One of the finest examples of a Taurian civilization is Ancient Egypt, from the unification of Upper and Lower Egypt (3100 BC). In the late Taurian period, during the Old Kingdom (about 2700-2200 BC), Egypt erected some of the grandest architectural wonders of the ancient world and of all times, such as the Giza pyramids and the Great Sphinx. The three great pillars of human life on the Earth – civilizational order, religion, and spiritual tradition were all alive. They were aligned with each other, and they were feeding each other. They were all unified by the role of the Pharaoh, which was the ruler and the representative of a higher world on the Earth. The hierarchy was clear. Everybody knew their place in relation to each other. 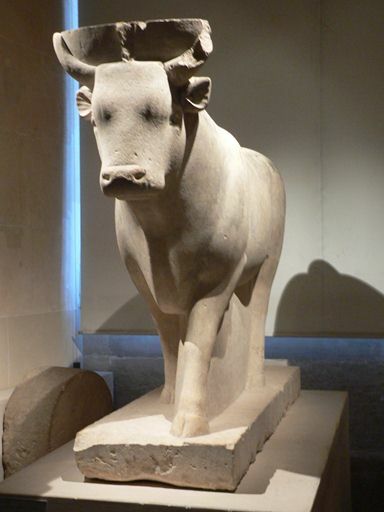 Religiously, the Age of Taurus in Egypt coincides with the worship of Apis, the bull-deity, the most important of all sacred animals in Egypt, said to be instituted during the Second Dynasty of the Early Dynastic Period of Egypt. Apis was originally the Herald of Ptah, the chief god in the area around Memphis, Egypt’s capital during this period. 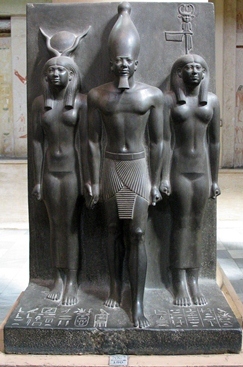 As a manifestation of Ptah, Apis also was considered to be a symbol of the pharaoh, embodying the qualities of kingship. The Egyptian goddess Bat (later Hathor) was commonly depicted as a cow goddess with head horns. In Sumer, the agricultural year started with the Akitu (literally, “barley”) festival marked by the spring equinox, in which the Sun was in the constellation of Taurus. 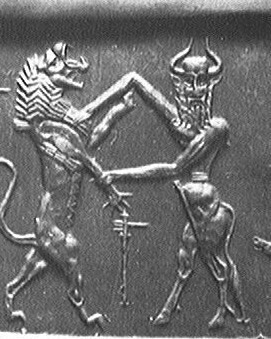 In the Sumerian myth of Gilgamesh, Gugalanna, the heavenly bull, was sent by the gods to take retribution upon Gilgamesh for rejecting the temptation of the goddess Inanna. Gilgamesh, represented by the Sun, and his companion Enkidu slay the bull, representing the disappearance of the constellation of Taurus in the glare of the Sun – exactly what happens during the spring equinox of that age. 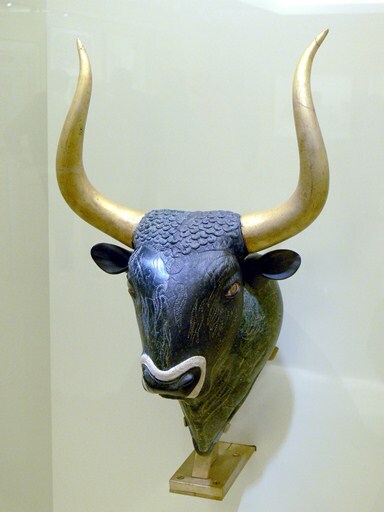 In Crete, one of the Minoans central religious themes was the bull and its horns of consecration. 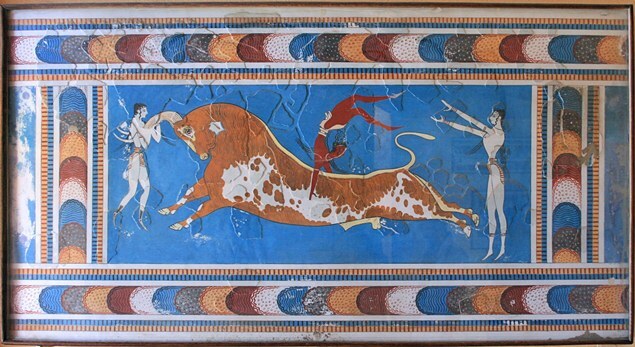 Bull leaping and bulls in general are believed to have been an important part of Minoan culture. Excavations at Knossos have revealed several frescos depicting bull-leaping. The early Indus Valley Harappan religion was probably the source of the later Jainism and Hinduism. One of the main findings from this area is a seal which shows a horned figure seated in a posture reminiscent of the Lotus position and surrounded by animals, an epithet of the later Hindu gods Shiva and Rudra. Probably one of the lowest manifestations of the Taurian Age was the excessive materialism mentioned above. The unprecedented accumulation of extreme wealth in the centers of power during that period at times led the ruling class to forget its role of serving a higher spiritual purpose and to become corrupted. Some of the greatest architectural achievements were only possible with the use of slaves who had no human rights whatsoever. On the other hand, an imaginary view of the level of the gods, attributing them a human character, combined with the absolute power of the ruling class and the religious priesthood, led to the monstrous custom of human sacrifice. Only later, in the Age of Aries, this custom will be rejected (at least in the Old World) and replaced, for the time, by animal sacrifice. The end of the Taurian Age and the emerging influence of Aries at the turn of the second millennium BC were the backdrop for some major transitions in the civilizations of the time: In Egypt, the first intermediate period which marks the chaotic time between the Old and the Middle Kingdoms starts very close to 2200 BC and lasts for about two centuries, which takes Egypt into the next Zodiac Age; By the end of the third millennium BC, the Semitic Akkadian people basically merged into the Sumerian empire, eventually took over, and later established Babylon, who played an important role in the Age of Aries; A series of natural disasters hit the Minoan civilization during the second millennium BC and by the time that the influence of the next Age of Aries went into full power, the Minoan civilization was declining and disappearing in the mists of time. Within two centuries of the beginning of the second millennium BC, the Indus civilization collapsed due to climate changes and a decline in trade with Egypt and Mesopotamia.